Rome with Marisa is a tour company? 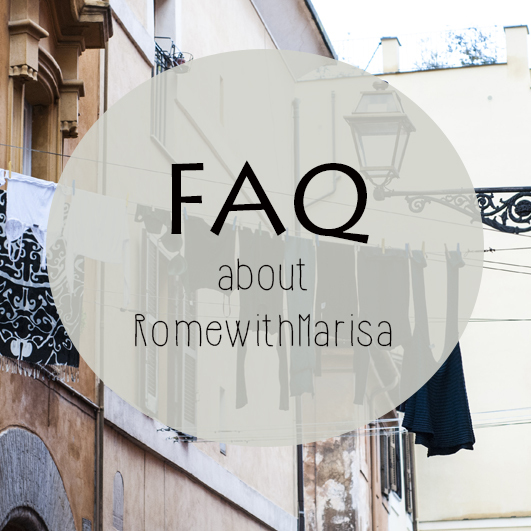 No, Rome with Marisa is NOT a tour company. This is the website of a professional and indipendent tourist guide in ROME. I provide tours in Italian and English. I do not accept more than one tour per day, to provide only high quality service, so my availability is limited. When I'm busy (the peek of the season is May-July), I can give you the name of another tourist guide with a similar profile. You are a qualified tourist guide of Rome? Yes, I'm very proud to be a qualified tourist guide.I've passed an examination, published by the Provincia di Roma (Roman Provincial Administration): now I'm a qualified tourist guide of Rome So I'm fully licensed guide, and this is my main activity. In addition, I'm a Museum Educator at the Vatican. Why I should choose a qualified guide? First for your safety. In Rome to work as a Tourist Guide you need a badge/certification. We MUSTdisplay our licence during the tour. Touring without this badge it's ILLEGAL! If during your tour, your guide is stopped by police because she/he is unauthorized, you'll waste money&time. So be sure to hire only a Professional&Qualified guide, you'll have a better service and a guarantee of legality. Do you provide tours in Venice/Naples/Florence/ Pompei etc.? No. Since I'm a local guide, my daily activity is providing historical tours in Rome (and surroundings).I can suggest you qualified guide like me for other cities. Do you have a car? Can you bring us in your private car? NO, I dont. I'm not a driver. I do not have the commercial licence to take you in my car. I provide WALKING tours, with a special focus on Art and Archaeology. If you need a transfer during one of my tours, I'll hire for you a professional driver with a car. Do you provide group tours or shared tours? No. My tours are designed for small groups, families, friends (10 persons max) and are strictly private and exclusive. No strangers in your group, just your family. What are your fees? € 55 per hour (165€ for an half day, 385€ for a fullday) The price is per tour, not per person. So is the same cost if you are 2 or 8 guests. The price is only for my service of private guide.The price of a tour depends on duration. Overcharge in case of evening tours or for national holidays.Tickets, transports and meals are not included. Where we should meet you? You can send a message to info@romewithmarisa.com. I'll reply as soon as possible with my suggestions and to confirm my availability. Please remember that I'm not a tour company, but an indipendent guide, so my availability is limited. Can I call you? Can I book by phone? No. Due to bad experiences and misunderstandings, I do not accept anymore bookings by phone. I'll send you my mobile after the booking, to use the day of the tour and for emergencies. Do I have to send a deposit? To leave a deposit is suggested but not compulsory. After your confirmation, I’ll send you a booking page that you can print and take with you (with my contacts and details about meeting point). Only after that, I'll consider your tour booked. How many weeks before do I have to book your tours? If you have in program to visit Rome in the peek of the touristic season (April- May-June-September), I suggest you to write me as soon as possible, at latest 4 months before your tour.On Fall and Winter, I can arrange a tour with a short notice. After my "Comfirmed booking" message, I'll consider your booking confirmed. All I ask you is to contact me MAX 48 hours before, if you want to delete the booking.In case of no-show, the basic fee will be paid to my PayPal account. My tours are provided even in case of rain. We'll use umbrellas and raincoats.I'm flexible to change program if you prefer to visit something indoor or to reschedule the tour (if I'm available). Do I have to wait in line during your tours? No. For the Colosseum and Vatican I'll suggest you how to book tickets to skip the line at the ticket office. Please note that delays and lines are possible at the Colosseum, due to the new security alert, even with prebooked tickets. What is the dress code at the Vatican Museums? It’s not possible to enter in the Sistine Chapel and in the St.Peter’s Basilica with hats, miniskirt, shorts above the knees and tops. If you have some doubts about what to wear, you can follow this simple rule: shoulder and knees covered.This rule is applied for men, women and even kids. Bermuda shorts are OK, Capri pants OK.No sleeveless shirts admitted. Do you provide private tours of the Undergrounds of the Colosseum? No. I cannot provide private tours of the underground chambers/top tiers. Only big tour companies have the chance to take their groups there. For the individuals, visits are possible only if you join a guided tour managed by the Colosseum, and the guide is a local expert (Group of 20/25 guests). The visit must be booked separately, it's a group tour and for its duration (1. 30 h) is not compatible with my tour. If interested, you can try to book your tour for the website of the Colosseum and book with me the Forum/Palatine Hill tour.